We have written for years about how the OECD, a club of rich countries has dominated the international tax system and that this inevitably skews the system in the favour of, well, rich countries. A potentially far more representative body exists — the UN Tax Committee — but the OECD and its member states have exerted powerful pressure to restrict its mandate and powers and to ensure that it is under-resourced, given low status, and unable to mount a challenge to rich countries’ needs. Ten reasons why an intergovernmental UN Tax Body will benefit everyone. A key step towards a coherent global system. Currently, the international tax system consists of a complicated web of thousands of bilateral tax treaties and different parallel international systems to regulate, for example, information exchange and corporate reporting. Negotiation of a globally agreed system is the only way to remove the complexity, confusion, inconsistency and mismatches that exist today. A truly global tax body is a crucial first step towards this goal. Stronger cooperation between tax administrations. A coherent global system will make it easier for tax administrations to communicate and cooperate. This will further strengthen international coherence and improve working conditions for tax administrations. Less unilateral action. Blacklisting and special restrictions on transfer pricing, financial transfers, corporate reporting and documentation are only some of the measures individual governments are currently introducing to protect their tax base. If the crisis in the global tax system continues to be unresolved, we are likely to see many more of these kinds of self-protective measures. Only truly global cooperation can ensure that all governments have a real alternative to unilateral action. Ending the race to the bottom. The fear of losing investments is currently driving governments to introduce tax incentives, loopholes and harmful tax practices in a tragic ‘race to the bottom’, which is costing countries billions of dollars in lost tax income. Through truly global cooperation, we can turn this sad development around. Better business environment. Clear, consistent, global and stable rules are good for business. Operating across diverse, inconsistent national tax systems creates heavy administrative burdens, legal uncertainty and high risks for international business. A level playing field. Today, governments who commit to increasing transparency and closing loopholes fear that being a ‘first mover’ will result in businesses and wealthy individuals registering themselves in other jurisdictions. Through truly global negotiations, governments can agree on coordinated global action and ensure a level playing field. Stronger implementation. No government will feel obliged to implement tax standards and norms adopted in closed rooms where it was not welcome. The UN is the only global institution where all governments participate as equals, and therefore the place to achieve a global commitment to action. Less double taxation and double-non-taxation. The wide variety of mismatches between national tax systems is the core reason why some get taxed twice on the same income while others don’t get taxed at all. Only truly global cooperation can put an end to these problems. More financing for development in the poorest countries. Currently, the world’s poorest countries are excluded from decision making on global tax standards, and international systems often don’t take into account their realities and inter ests. This means lower tax income and thereby less available financing for development in these countries. 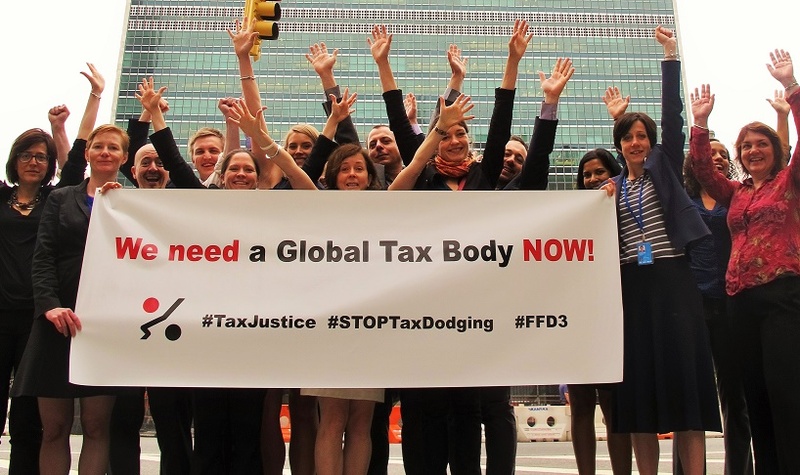 Fair and consistent global action against tax havens. Many governments are currently trying to protect their tax base through national blacklists based on criteria that are often both unclear and inconsistently applied. While random blacklisting can be burdensome for impacted countries, it will not solve the tax haven problem. Action against tax havens must be fair, consistent and globally coordinated in order to be effective. You can read this briefing in French or Spanish too.